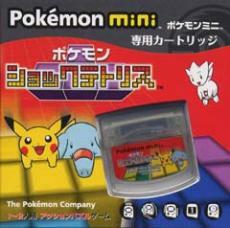 An unreleased US version of this game called “Pokémon Mini Shock Tetris” was rated “Everyone” by the Electronic Software Rating Board (ESRB). Some kind of perfect union, the Pokemon Mini and Tetris, I want! After 20h of Tetris grinding, I finally caught my last Pokemon in this game! There are ways to make uncatched monsters spawn with a 100% rate by getting a 5-liner. Different difficulties decide which “rareness group” will be available. Haha lopingg, that is some dedication! I played the game a lot, but never dedicated that much time/effort to completing the PokeDex. I have the original cart of Pokemon Mini Tetris! Might be worth a lot of money in 10 years or so!! it was surely released in europe as i have the cartridge. Hi! Does anyone know if it’s possible to catch mew in this game?